We’d love your help. Let us know what’s wrong with this preview of Terre des hommes by Antoine de Saint-Exupéry. "Nous habitons une planète errante." Saint-Exupéry, qui vient d'être nommé pilote de ligne, découvre, admire, médite notre planète. Assurant désormais le courrier entre Toulouse et Dakar, il hérite d'une vaste responsabilité à l'égard des hommes, mais surtout de lui-même et de son rapport au monde. Tout en goûtant "la pulpe amère des nuits de vol", il apprend à habiter la "Nous habitons une planète errante." Saint-Exupéry, qui vient d'être nommé pilote de ligne, découvre, admire, médite notre planète. Assurant désormais le courrier entre Toulouse et Dakar, il hérite d'une vaste responsabilité à l'égard des hommes, mais surtout de lui-même et de son rapport au monde. Tout en goûtant "la pulpe amère des nuits de vol", il apprend à habiter la planète et la condition d'homme, lit son chemin intérieur à travers les astres. En plus du langage universel, il jouit aussi chaque jour de la fraternité qui le lie à ses camarades du ciel. Il rend hommage à Mermoz ou à Guillaumet, à qui est dédicacé le roman, et dont il rappelle les célèbres paroles : "Ce que j'ai fait, je le jure, jamais aucune bête ne l'aurait fait." To ask other readers questions about Terre des hommes, please sign up. I will probably be tempted to compare "Terre des Hommes" to "Le Petit Prince". As the latter is an extremelly tough piece to follow, will this ruin the whole experience for me or should I regard "Terre des Hommes" as an entirely different spiritual quest? Is this appropriate for kids (age 10)? Wind, Sand and Stars (French title: Terre des hommes) is a memoir by the French aristocrat aviator-writer Antoine de Saint-Exupéry, and a winner of several literary awards. It deals with themes such as friendship, death, heroism, and solidarity among colleagues, and illustrates the author's opinions of what makes life worth living. My favorite part of this book is where he lands on an inaccessible plateau in North Africa and, after marvelling that he is the first living thing EVER to have drawn breath here, notices that the place is littered with meteorites. And what is so wonderful about this book is not that St. X experienced that moment, but that through him, *I* get to experience it too. "Nous demandons à boire, mais nous demandons aussi à communiquer." The pages are filled with the desperation to communicate, man's love of solitude tempered and ruined by his dependence on others. This is the landscape of The Little Prince--all the characters are here, and were real. 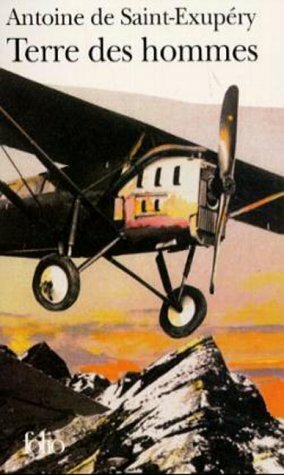 Incidentally, I'd forgotten what a huge influence the core story in this book--plane crash in the desert and subsequent brush with nearly dying of thirst--was on my own book, The Sunbird. Whenever I am forced to name my most favorite book ever, my automatic response is Antoine de Saint-Exupery’s The Little Prince. I read it first when I was a boy but I did not understand what was it all about except the hat with an elephant inside and the planet with big trees called baobab. The second time was in college when it was a required reading in World Literature. I did not really like it until my professor explained that the novel was about man’s search for friendship. I recall that the Whenever I am forced to name my most favorite book ever, my automatic response is Antoine de Saint-Exupery’s The Little Prince. I read it first when I was a boy but I did not understand what was it all about except the hat with an elephant inside and the planet with big trees called baobab. The second time was in college when it was a required reading in World Literature. I did not really like it until my professor explained that the novel was about man’s search for friendship. I recall that there was no internet at the time and I still had to go to the school library to research more on Saint-Ex’s life so I can make a better book report. We were not required to read other books (that was great since you know how busy a college student can be) of the same author and there was no Wikipedia yet. So, my knowledge of Saint-Ex stopped with his tale of this little prince. I re-read it from cover to cover this month as it was voted by the Filipinos here in Goodreads for February 2012 group read. It was for this reason, why I read this other popular Antoine de Saint-Exupery’s book, Wind, Sand and Stars. I wanted to find out more about the man and probably more about The Little Prince. Since this was originally written in French, its title was Terre des homes that literally means “Land of Men” when it was published in France in 1939. Later that year, it was published in the US as “Land of People” But when The Little Prince became a worldwide phenomenon in 1943, the US publishers changed the title to Wind, Sand and Stars maybe to establish its connection between the two books. In the US, this book Wind, Sand and Stars won the National Book Award in 1939 for the Non-Fiction Category. The National Geographic Adventure magazine also memoir as No. 3 in its all-time list of 100 best adventure-exploration books. For you who loved The Little Prince, read this book. You will see semblances of that book’s characters and events with what happened to Saint-Ex in this book. There is a scene here where Saint-Ex, the pilot of Aerospostale (airmail carrier) landed in a place full of meteorites. 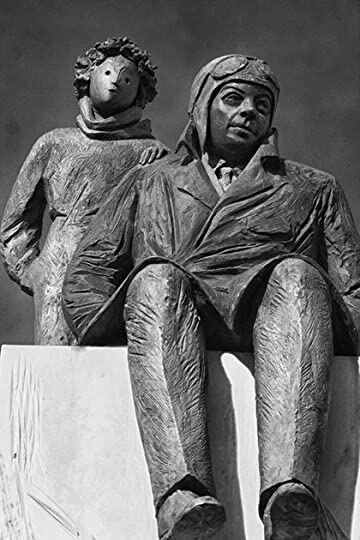 There is his bestfriend Henri Guillaumet (1902-1940) who in June 13, 1930, crashed in another place and though tempted to give up, he persisted while thinking of his wife, Noëlle, (very similar to Saint-Ex thinking of his rose) until June 19 at dawn when he was rescued by a 14-year-old boy named Juan García (who should be his inspiration for his Little Prince character). Some critics say that Guillaumet is Little Prince himself or maybe the fox but Saint-Ex dedicated that book to Leon Werth, his other friend who he met in 1931. Léon Werth (1878-1955) spent the war unobtrusively in Saint-Amour, his village in the Jura, a mountainous region near Switzerland where he "was alone, cold and hungry", and had few nice words on French refugees. Saint-Ex returned to Europe in early 1943, rationalizing, "I cannot bear to be far from those who are hungry... I am leaving in order to suffer and thereby be united with those who are dear to me." The book is very insightful. He reminded me of Richard Bach who wrote my favorite love story, The Bridge Across Forever. Saint-Ex brilliantly connected love, life, flying and male friendship. I am sure that he inspired Bach who is also a pilot and a novelist. Flying in 2015 has become about as commonplace and unexciting as taking the subway to work or the train to the weekend lodge. It is safer than driving a car and most of the work, beside take-offs and landings, is done by sophisticated instruments. What we have gained in safety and comfort. We may have lost in our sense of wonder and our perspective. Antoine de Saint-Exupery, poet and pioneer aviator, is probably our best guide back to the miracle of flight, and this present autobiographical novel is I believe the best example of his profound humanism and lyrical prose. Considering some common details about a plane crash in the desert, the eagle-eye view of humans struggling to fill in huge empty spaces on a planet hurtling through a vast emptiness, the common themes of friendship, love, death, peace, Terre des Hommes is closely related to Le Petit Prince, the more famous novella about the boy who looks at earth with innocent and hopeful eyes. Thus, when Mermoz first crossed the South Atlantic in a hydroplane, as day was dying he ran foul of the Black Hole region, off Africa. Straight ahead of him were the tails of tornadoes rising minute by minute gradually higher, rising as a wall is built; and then the night came down upon these preliminaries and swallowed them up; and when, an hour later, he slipped under the clouds, he came out into a fantastic kingdom. Great black waterspouts had reared themselves seemingly in the immobility of temple pillars. Swollen at their tops, they supported the squat and lowering arch of the tempest, but through the rifts in the arch there fell slabs of light and the full moon sent her radiant beams between the pillars down upon the frozen tiles of the sea. Through these uninhabited ruins Mermoz made his way, gliding slantwise from one channel of light to the next, circling round those giant pillars in which there must have rumbled the upsurge of the sea, flying for four hours through these corridors of moonlight towards the exit from the temple. And this spectacle was so overwhelming that only after he had got through the Black Hole did Mermoz awaken to the fact that he had not been afraid. Mermoz and his mechanic had been forced down at an altitude of twelve thousand feet on a table-land at whose edges the mountains dropped sheer on all sides. For two mortal days they hunted a way off this plateau. But they were trapped. Everywhere the same sheer drop. And so they played their last card. Themselves still in it, they sent the plane rolling and bouncing down an incline over the rocky ground until it reached the precipice, went off into air, and dropped. In falling, the plane picked up enough speed to respond to the controls. Mermoz was able to tilt its nose in the direction of a peak, sweep over the peak and, while the water spurted through all the pipes burst by the night frost, the ship already disabled after only seven minutes of flight, he saw beneath him like a promised land the Chilean plain. And the next day he was at it again. When I think of Guillaumet, Mermoz, Saint-Exupery and of their colleagues in the Aeropostale , I have this image of one of our Romanian monuments to the early aviators: their arms spread out and covered with feathers, they went to the sky as naturally as we walk, they fought singlehanded against wind, darkness, cold and tiredness, and they paid dearly for their daring, falling back to ground in flames, like Icarus. In their own words: It was worth it! Even as the peasant strolling about his domain is able to foresee in a thousand signs the coming of the spring, the threat of frost, a promise of rain, so all that happens in the sky signals to the pilot the oncoming snow, the expectancy of fog, or the peace of a blessed night. The machine which at first blush seems a means of isolating man from the great problems of nature, actually plunges him more deeply into them. As for the peasant so for the pilot, dawn and twilight become events of consequence. His essential problems are set to him by the mountain, the sea, the wind. Alone before the vast tribunal of the tempestuous sky, the pilot defends his mails and debates on terms of equality with those three elemental divinities. An interesting chapter describes the flying machines they used on their missions, and Saint-Exupery uses the occasion to lash out at those who complain about the modern man’s dependence on technology. It is not the tool itself that drives us away from nature, but the way we use it. Like the ever-present so-called ‘smart’ phones, they are not making us lonely by breaking up our direct contact with our fellow men, their role is actually to make it easier to communicate and get in touch. Airplanes also bring us closer together by reducing the travel times and thus the distances that separate us. Transport of the mails, transport of the human voice, transport of the flickering pictures – in this century as in others our highest accomplishments still have the single aim of bringing men together. Do our dreamers hold that the invention of writing, of printing, of the sailing ship, degraded the human spirit? A man cannot live a decent life in cities, and I need to feel myself live. I am not thinking of aviation. The airplane is a means, not an end. One doesn’t risk one’s life for a plane any more than a farmer ploughs for the sake of the plough. But the airplane is a means of getting away from towns and their bookkeeping and coming to grips to reality. Flying is a man’s job and its worries are a man’s worries. A pilot’s business is with the wind, with the stars, with night, with sand, with the sea. He strives to outwit the forces of nature. He stares in expectancy for the coming of dawn the way a gardener awaits the coming of spring. He looks forward to port as to a promised land, and truth for him is what lives in the stars. When I opened my eyes I saw nothing but the pool of nocturnal sky, for I was lying on my back with outstretched arms, face to face with that hatchery of stars. Only half awake, still unaware that those depths were sky, having no roof between those depths and me, no branches to screen them, no root to cling to, I was seized with vertigo and felt myself flung forth and plunging downward like a diver. But I did not fall. From nape to heel I discovered myself bound to earth. I felt a sort of appeasement in surrendering to it my weight. Gravitation had become as sovereign as love. The earth, I felt, was supporting my back, sustaining me, lifting me up, transporting me through the immense void of night. I was glued to our planet by a pressure like that which one is glued to the side of the car on a curve. I leaned with joy against this admirable breast-work, this solidity, this security, feeling against my body this curving bridge of my ship. Life has taught us that love does not consist in gazing at each other but in looking together in the same direction. There is no comradeship except through union in the same high effort. Even in our age of material well-being this must be so, else how should we explain the happiness we feel in sharing our last crust with others in the desert? [...] What sets us against one another is not our aims – they all come to the same thing – but our methods, which are the fruit of our varied reasoning. We told stories, we joked, we sang songs. In the air there was that slight fever that reigns over a gaily prepared feast. And yet we were infinitely poor. Wind, sand, and stars. The austerity of Trappists. But on this badly lighted cloth, a handful of men who possessed nothing in the world but their memories were sharing invisible riches. We had met at last. Men travel side by side for years, each locked up in his own silence or exchanging those words which carry no freight – till danger comes. Then they stand shoulder to shoulder. They discover that they belong to the same family. They wax and bloom in the recognition of fellow beings. They look at one another and smile. They are like the prisoner set free who marvels at the immensity of the sea. Happiness! It is useless to seek it elsewhere than in this warmth of human relations. Our sordid interests imprison us within their walls. Only a comrade can grasp us by the hand and haul us free. Old friends cannot be created out of hand. Nothing can match the treasure of common memories, of trials endured together, of quarrels and reconciliations and generous emotions. It is idle, having planted an acorn in the morning, to expect that afternoon to sit in the shade of the oak. Αγαπώ ή μάλλον όχι, λατρεύω το Σαιντ Εξυπερύ. Νιώθω λίγο κουτή που μέχρι τώρα είχα διαβάσει μόνο τον Μικρό Πρίγκιπα θεωρώντας ανόητα ότι ήταν ότι καλύτερο έχει να προσφέρει. Στο «Η γη των ανθρώπων» μας αφηγείται τις πιλοτικές του εμπειρίες, όλες αυτές τις ολοκληρωτικές, αχανείς εικόνες ενός κόσμου που από εκεί ψηλά μοιάζει τρομακτικά απέραντος… Αυτές που τον μάγεψαν, τον ωρίμασαν και τον έπλασαν σε αυτόν τον μαγευτικό καλλιτέχνη. Και πόσο υπέροχη, σαγηνευτική αφηγηματική γλώσσα χρησιμοποιεί… Όταν θ Αγαπώ ή μάλλον όχι, λατρεύω το Σαιντ Εξυπερύ. «Κάπου αλλού ίσως οι άνθρωποι βυθομετρούσαν το άπειρο ή έκαναν τους υπολογισμούς πάνω στο νεφελοειδή της Ανδρομέδας. Αλλού έκαναν έρωτα. Κάπου απόμερα φέγγανε στον κάμπο αυτές οι φωτιές σαν να αποζητούσαν να ξαναγεννηθούν. Ακόμα και ως τ’ απόμερα που βρισκόταν ο ποιητής, ο δάσκαλος, ο μαραγκός. If I had to choose between The Little Prince and this book, I'd choose this book, because in a way you can use it to derive Saint-Exupéry's classic. If The Little Prince is the diamond, this book is the coal: a hard-earned mass of adventure and experience. The book reads like a long letter from your most astonishing friend. Sublime. I was a member of this book club and just liked the look of the cover and in my stupidity I thought that it would just be about the desert (that I love),the wind and stars. I had no idea that this French aristrocrat, writer, poet and author of the "Le Petit Prince" was a pilot. I must confess that initially I thought it all rather difficult to absorb but I was determined to enjoy this book and I did indeed. What an incredible individual and a true adventurer. I was inspired by it all and to think that he died in the forties. Such a shame. I hope that there is indeed an afterlife because this gentleman truly deserves it. Plus he has given great pleasure to a minor individual like me and for that I applaud him. Transcendant, beautiful, embracing. When I read three books in a row where this book featured prominently (The Goldfinch was one) I felt the book calling to me. For me, it was not the type of book that I could sit down and read in one go. I wanted to mull and linger on the words, and to embrace St Exupery's words demands a kind of internal honesty and emotionality from the reader that can be freeing but also emotionally exhausting. I think that is why I put it down so often. I mean, I started th Transcendant, beautiful, embracing. When I read three books in a row where this book featured prominently (The Goldfinch was one) I felt the book calling to me. For me, it was not the type of book that I could sit down and read in one go. I wanted to mull and linger on the words, and to embrace St Exupery's words demands a kind of internal honesty and emotionality from the reader that can be freeing but also emotionally exhausting. I think that is why I put it down so often. I mean, I started this book August 2014, and finished August 2016- how is that for timing? Still, an excellent book, and one I would suggest to anyone that likes a good adventure memoir or wants to question the human condition or spirit. This short memoir for me was a wonderful adventure in flying and parallel inward journey by the author. That puts this book on an honored shelf with Mathiessen’s “The Snow Leopard”. 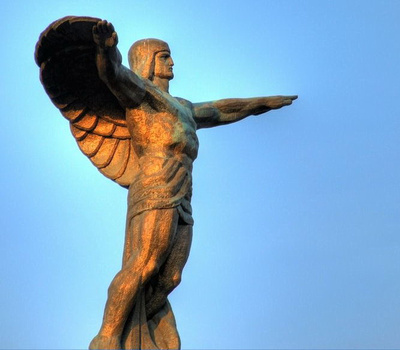 St. Expery’s experiences in the 20’s with the French airmail service to North Africa and South America had comparable mind altering impacts and serious humbling in the face of nature’s powers. But instead of a serious quest and a single journey, we get a more open-ended set of stories bound to his flying career and p This short memoir for me was a wonderful adventure in flying and parallel inward journey by the author. That puts this book on an honored shelf with Mathiessen’s “The Snow Leopard”. St. Expery’s experiences in the 20’s with the French airmail service to North Africa and South America had comparable mind altering impacts and serious humbling in the face of nature’s powers. But instead of a serious quest and a single journey, we get a more open-ended set of stories bound to his flying career and pathways of development for the author’s core values and sources of hope for the human race. I delayed writing this review for half a year since reading it. It is the kind of delicious book where you want to mark passages on almost every page, so it was hard to pin down the real take-home messages worth sharing. With some perspective now, I can boil my pleasures down. It makes you feel connected to the universe. And part of a human community also struggling to comprehend and come to terms with its mysteries and epiphanies, treacheries and cruel destructions. The mysteries that flying opens his mind to come immediately with its ticket to a leap into different perspectives. How small all our human constructions appear from the air. How quickly you can be in a different world among the clouds get lost among dangerous mountains, vast deserts, or the endless sea. We get to share in the joys and fears of his first flights. The experience of unboundedness is balanced by strange connections with the plane, the technological wonder his life depends on. He is grounded as well with the camaraderie of his team, including the mechanic and radio man he usually shared his flights with and the fellow pilots he bonded with between flights. These connections rise to special prominence when he or others get in storms, fall out of radio communications, or get stranded after being forced into an emergency landing after equipment failure or fuel shortage. So the crew fly on with no thought that they are in motion. Light night over the sea, they are very far from the earth, from towns, from trees. The motors fill the lighted chamber with a silver that changes its substance. The clock ticks on. The dials, the radio lamps, the various ands and needles go through their invisible alchemy. From second to second these mysterious stirrings, a few muffled words, a concentrated tenseness, contribute to the end result. And when the hour is at hand the pilot may glue his forehead to the window with perfect assurance. Out of oblivion the gold has been smelted: there it gleams in the lights of the airport. And with that we knew ourselves to be lost in interplanetary space among a thousand inaccessible planets, we who sought only the one veritable planet, our own, that planet on which alone we should find our familiar countryside, the houses of our friends, our treasures. When I opened my eyes I saw nothing but the pool of nocturnal sky, for I was lying on my back with outstretched arms, face to face with that hatchery of stars. Only half awake, still unaware that those depths were sky, having no roof between those depths and me, no branches to screen them, no root to cling to, I was seized by vertigo and felt myself as if flung forth and plunging downriver like a diver. I lay there pondering my situation, lost in the desert and in danger, naked between sky and sand, withdrawn by too much silence from the poles of my life. I knew that I should wear out days and weeks returning to them if I were not sighted by some plane, or if next day the Moors did not find and murder me. Here I possessed nothing in the world. I was no more than a mortal strayed between sand and stars, conscious of the single blessing of breathing. And yet I discovered myself filled with dreams. I landed in the peace of the evening. Punta Arenas! I leaned against a fountain and looked at the girls in the square. Standing there within a couple of feet of their grace. I felt more poignantly than ever the human mystery. In a world in which life so perfectly responds to life, where flowers mingle with flowers in the wind’s eye, where the swan is the familiar of all swans, man alone builds his isolation. What a space between men their spiritual natures create! A girl’s reverie isolates her from me, and how shall I enter into it? What can one know of a girl who passes, walking with slow steps homeward, eyes lowered, smiling to herself, filled with adorable inventions and with fables? Out of the thoughts, the voice, the silences of a lover, she can form an empire, and thereafter sees in all the world but him a people of barbarians. More surely than if she were on another planet, I feel her to be locked up in her language, in her secret, in her habits, in the singing echoes of her memory. Born yesterday of the volcanoes, of greenswards, of brine of the sea, she walks here already half divine. …I know nothing. I do not enter into their empires. Man in the presence of man is as solitary as in the face of a wide winter sky in which there sweeps, never to be tamed, a flight of trumpeting geese. This book was a small wonder for me, and I expect it would be so for many of my friends. It reminds me of the line from Leonard Cohen: “We are so small between the stars so large against the sky”. In a couple of sittings, you can be transported and return to earth a better person. I found a free copy on the internet, but I can’t share it because I don’t know if it is an illegal version. اللحظات العظيمة هي تلك اللحظات التي تمسك بيديك كتابا أحببته وعشت معه لحظات سعيدة والكتاب الذي تحزن لفراقه هو الكتاب الذي يمّسّك بقوة .. الكتاب الذي يحلّق بك إلى أعلى سماء ممكن أن تطالها .. لطالما كان الحلم بأجنحة وهذا ما يفعله أكزوبيري الروائي الفرنسي الجميل صاحب الرواية الصغيرة الأمير الصغير الذي عمل لفترة طويلة في تجربة الطائرات فامتهن المغامرة هو ورفاقه الطيارين كما تكون المغامرة الحقيقية وها هو يقدم لنا تلك الأجنحة الطيارة لنسافر معه بعيدا ..
ينظر من أعلى الحلم لكل تلك الأشياء الجميلة التي تبدو كالنقطة وتصبح في الأعلى لها معاني أخرى لا يدركها من تلمس رجليه الأرض ..
قرأت مرة مقالا في مجلة دبي الثقافية كان فيه أكزوبيري يحكي عن كيف ممكن أن يتنفس الغرق تحت الماء أعني يتنفس الماء وهو يسقط في الماء وكيف يجب أن يفتح رئتيه له اعتبرها الكثيرين نبوءة لموته الذي جاء إثر سقوط طائرته بعد أن ضربتها طائرة ألمانية وهو في مهمة إستطلاعية حسب المقال ليسقط في الماء ويموت كما كانت النبوءة .. حين تقرأ أرض البشر ستعرف سرّ هذا العشق الكبير للماء .. فمن هو أكثر قدرة على معرفة ماذا يعني الماء أكثر من تائه في الصحراء سقط أكزوبيري وهو متجه لبنغازي في الصحراء مع صديق له وحيث إنه نجا من هذا السقوط لكنه لم ينجو من السراب والعطش والضياع في الصحراء .. إمشي كما قال غيومه وهكذا بدأ يمشى يجره السراب في متاهات عظيمة الجفاف يجرح شفتيه و دون أن يعرف إلى أين يمضي .. The steadily growing stream of birth and marriage announcements on my Facebook feed has led me to rethink these “steps” that most people take each passing year. I used to think (and still sometimes do when I’m feeling unsure or cynical) that this seemingly prewritten way of living, of societal norms pushing us forward, was depressing evidence for a lack of creativity. But lately I see these steps not as predetermined chains on a pair of manacles we never knew we were wearing, but as a climb up a The steadily growing stream of birth and marriage announcements on my Facebook feed has led me to rethink these “steps” that most people take each passing year. I used to think (and still sometimes do when I’m feeling unsure or cynical) that this seemingly prewritten way of living, of societal norms pushing us forward, was depressing evidence for a lack of creativity. But lately I see these steps not as predetermined chains on a pair of manacles we never knew we were wearing, but as a climb up a mountain or a neverending game of “I dare you.” I dare you to try more, to do something different, to remember or to learn how best to live. We only have one first. A first time riding in a plane, a first time seeing the ocean, a first time eating an orange, a first time falling in love. It happens and it finishes in the same moment. A simultaneous life and death that will slowly kill us if we don’t realize it. Antoine de Saint-Exupéry wants us to realize it. To do so he shares exquisite moments where he realized it during his career as an Aéropostale pilot in Northern Africa and South America. He’s lying atop a pebbled ledge in the Sahara Desert and finds a meteorite and knows he’s the only soul who has ever seen this rock. It’s a first, but one that he wants us to savor. He’s in the desert in Libya, three days without water, and he sees fantastic mirages—they are false, but they are something new only once, and he wants us to appreciate that. What he wants is neither that new nor that radical. By recounting his memories he wants to inspire us to unlock our hands from our keyboards, to put our wallets back in our pockets, to unleash the shopkeepers from their shops, to look in a mirror, to look at each other, and to recognize something. از بخش 7 کتاب( که دست و پنجه نرم کردن نویسنده برای زنده موندنه) تونستم باهاش ارتباط برقرار کنم و برای همین فکر میکنم یک بار دیگه باید برگردم و کتاب را مجددا از ابتدا بخونم ..
" ... وقتی به دنبال تحولی، جهشی در باغی ، گل سرخ نوظهوری پدید اید باغبانها همه به جنب و جوش می ایند. ان را جدا میکنند و کشت میدهند و زمینه را برای رشد سریع ان مهیا میکنند. اما برای انسان ها باغبانی نیست. " " مرا دردی عذاب میدهد که با انفاق به مستمندان و اطعام مساکین دوا نمیشود . سوز دل من نه از این قوز و گره های پیکر این کارگران و نه از زشتی این محنت بلکه از انست که در هر یک از این انسان ها موتسارت است که کشته میشود . Kitap okuyorsam, beş bin yılın hikayesini; bir ömürde dinlemek, anlamak içindir. Öyleyse şimdi sıra geldi "Yel, Kum ve Yıldızlar" kitabına. 2013 yılında ben de; hemen herkes gibi, Küçük Prens kitabıyla tanıştığım Antoine de Saint-Exupery'nin trajik yaşam öyküsünü de bilahare okuduktan sonra bu kitabı da okumaya karar kılmıştım. Kitabın beni oldukça etkilediğini söyleyebilirim. Jack London'ın Yabanın Çağrısı'nda bahsettiği "Çağrı"yı yüreğinden işitip (yazar kitabında buna iççağrı demiş) kendini çöl Kitap okuyorsam, beş bin yılın hikayesini; bir ömürde dinlemek, anlamak içindir. Kitabın beni oldukça etkilediğini söyleyebilirim. Jack London'ın Yabanın Çağrısı'nda bahsettiği "Çağrı"yı yüreğinden işitip (yazar kitabında buna iççağrı demiş) kendini çöle, kuma ve uçsuz bucaksız yıldızlara atan yazarın; seyredip hissettiklerini okuyoruz bu kitapta. Çölde, kumda ve yıldızlarda; bir Fransız'ı Fransızlıktan, bir Bedeviyi Bedevilikten, Mağribiyi Mağripten; Meşrıkıyı Meşrıktan ayıran ve insanı yalnızca insan haline getiren şeyleri görmüş, anlamış ve anlatmış yazar. Susuzlukta, yalnızlıkta, açlıkta, merakta ve hürriyette bir olan şeyi; insançocuğunun ortak yazgısını. Mesleği pilotluk olan yazarımız için, dünya bir bahçedir aynı zamanda; çocukluğunda dizini kanattığı bahçenin belki biraz daha büyükçesi! Mağribinin fukaralığındaki sadelik ve estetikte olduğu kadar (aklıma Marakeş'te Sesler kitabını getirir bu noktada); çölün, kumun ve yıldızların manzarası da pek müthiştir. "Ama insanlar için bahçıvan yoktur. Çocuk Mozart da ötekiler gibi kalıptan geçecektir. Mozart en yüce sevinçlerini çalgılı kahvelerin pis kokusu içinde, çürümüş bir müzikte bulacaktır. Mozart, ölmeye yargılıdır. Burada durmamacasına yeniden açılan yara olarak bahsettiği, Prometheus'un da hikayesinde özetlenen; insançocuğunun ekin başakları gibi hep yükselip hep çöken başı; trajedisidir. Belki de Prometheus'un hikayesinde de özetlenen buydu. Ve dahi, yazarın uğruna döktüğü gözyaşı, tıpkı; kitabı okuyanlar bilir, çöldeki sahnede "kendime mi ağlıyorum sanıyorsun?" sorusunda olduğu gibi; insançocuğunun hikayesinedir belki. Antoine de Saint-Exupery is one of the most brilliant humanist-writers. Every person is beautiful in their own way, each of us need to be open and forward in the right direction. "Human Planet," a great book, infinitely good and exciting. It exalted honor, friendship, kindness, helping others. We see how beautiful our planet is. But not only the nature of the world is worthy of attention and admiration - do not forget about the people. Exupery does not stop to admire the beauty of our planet, san Antoine de Saint-Exupery is one of the most brilliant humanist-writers. Every person is beautiful in their own way, each of us need to be open and forward in the right direction. "Human Planet," a great book, infinitely good and exciting. It exalted honor, friendship, kindness, helping others. We see how beautiful our planet is. But not only the nature of the world is worthy of attention and admiration - do not forget about the people. Exupery does not stop to admire the beauty of our planet, sand, mountains. He sees beauty even in the hands of the workers, stained with fuel oil. He rejects the political and economic forms of communication between people. After all, how beautiful this man's ability - to make friends! Personally, I feel very sad realizing that many people did not find themselves, stuck in a routine, forget about true human qualities. I would like to see the world around us has become brighter, and people - kinder to each other. In modern society, it is not enough. But we have rights to, and we can change this situation. The main thing - to want and believe that everything is possible. Антуан де Сент-Экзюпери один из самых ярких писателей-гуманистов. Каждый человек прекрасен по-своему, каждого из нас нужно открыть и направить в правильном направлении. "Планета людей" великолепная книга, бесконечна добрая и волнующая. В ней превозносятся честь,дружба,добро, взамопомощь. Мы видим как прекрасна наша планета. Но не только природа на Земле достойна внимания и восхищения - не стоит забывать и о людях. Экзюпери не перестает восхищаться красотой нашей планеты,песков,гор. Он видит красоту даже в рабочих руках,испачканных мазутом. Он отвергает политические и экономические формы связей между людьми. Ведь как прекрасна эта способность человека - дружить! Лично мне становится грустно от понимания того, что многие из людей так и не нашли себя,увязли в рутине, забывают о настоящих человеческих качествах. Мне бы хотелось, чтобы мир вокруг нас стал светлее,а люди - добрее друг к другу. В современном обществе этого очень не хватает. Но мы в праве и можем изменить это положение вещей. Главное - захотеть и поверить в то, что это возможно. The French author and aviator Antoine de Saint-Exupéry published his book in 1939. It was soon thereafter translated into English with the title Wind, Sand and Stars. The work is a collection of essays focusing on his years as an airmail courier for Aéropostale, flying difficult and dangerous routes across the Andes in South America, the Pyrenees in France and Spain, and the Sahara in north Africa. A number of his experiences are described in detail, the longest and most vivid bei Read in French. The French author and aviator Antoine de Saint-Exupéry published his book in 1939. It was soon thereafter translated into English with the title Wind, Sand and Stars. The work is a collection of essays focusing on his years as an airmail courier for Aéropostale, flying difficult and dangerous routes across the Andes in South America, the Pyrenees in France and Spain, and the Sahara in north Africa. A number of his experiences are described in detail, the longest and most vivid being his crash in the Sahara with his navigator, André Prévot, and their long struggle to survive until at last rescued by Bedouins. His final essay is a long and beautiful philosophical reflection on the meaning of life. Probably best know for his novel Le Petit Prince, Saint-Exupéry wrote a number of other books, most based on his experiences as a pilot, all of them fascinating. Having joined the Free French Air Force during World War II, old and in declining health, he disappeared while on a mission over the Mediterranean in 1944. Saint-Exupéry’s language is vivid, descriptive, and highly poetic. His books are almost prose-poems. He is able to capture the allure and beauty of flying, especially in the early years of flight, in a way few other authors have. Su šia knyga buvo labai nuobodu. Egzistenciniai klausimai "kas aš", "kokia prasmė" persvėrė istoriją, kurios neužščiuopiau. Neva autobiografija, neva romanas, daug karo, aviacijos ir žmonių hierarchijos. Skaitant mintys nuklysdavo į darbus, laisvalaikį, išeidavau iš knygos, o gal niekada joje ir nebuvau. Stabtelėdavau tik tose vietose, kuriose Egziuperi pasitelkdavo lyriką ir metaforas, jos buvo gražios. The only book I have ever read by de Saint-Exupery is (and this will come as no surprise) The Little Prince. I even had to read the original French version while in college. I don't know much about the author, but when I saw a review for this book, it intrigued me. I am glad I read it. This is full of great writing of de Saint-Exupery's life as a pilot delivering mail for Aeropostale. I originally picked it up to skim and determine if it would be my next read, but I was so taken by the passages t The only book I have ever read by de Saint-Exupery is (and this will come as no surprise) The Little Prince. I even had to read the original French version while in college. I don't know much about the author, but when I saw a review for this book, it intrigued me. I am glad I read it. This is full of great writing of de Saint-Exupery's life as a pilot delivering mail for Aeropostale. I originally picked it up to skim and determine if it would be my next read, but I was so taken by the passages that I read near to eighty pages in one sitting. "Fate has pronounced a decision from which there is no appeal." "The reason why writers fail when they attempt to evoke horror is that horror is something invented after the fact, when one is re-creating the experience over again in the memory." "Roads avoid the barren lands, the rocks, the sands. They shape themselves to man's needs and run from stream to stream ... We have elected to believe that our planet was merciful and fruitful." "I, too, in this flight, am renouncing things. I am giving up the broad golden surfaces that would befriend me if my engines were to fail. I am giving up the landmarks by which I might be taking my bearings. I am giving up the profiles of mountains against the sky that would warn me of pitfalls. I am plunging into the night. I am navigating. I have on my side only the stars." Nếu bạn sẵn sàng chấp nhận một thách thức thì hẵng đọc cuốn này! Bản dịch của Nguyễn Thành Long có vẻ bám rất sát câu chữ trong bản gốc và bởi vậy khá khó tiếp cận. Tôi nhớ đã thử gắng đọc vài ba lần bản dịch này do nxb Tác Phẩm mới ấn hành mà đều thất bại. Lần này đọc lại, tôi có tham khảo, nhiều khi là đọc song song, bản dịch của Bùi Giáng, để sáng tỏ những chỗ khó hiểu. Vậy mà cũng phải mất một phần ba cuốn mới bắt đầu vỡ vạc và càng ngày càng cảm nhận nhiều cái hay trong tác phẩm. Dường như Nếu bạn sẵn sàng chấp nhận một thách thức thì hẵng đọc cuốn này! Bản dịch của Nguyễn Thành Long có vẻ bám rất sát câu chữ trong bản gốc và bởi vậy khá khó tiếp cận. Tôi nhớ đã thử gắng đọc vài ba lần bản dịch này do nxb Tác Phẩm mới ấn hành mà đều thất bại. Lần này đọc lại, tôi có tham khảo, nhiều khi là đọc song song, bản dịch của Bùi Giáng, để sáng tỏ những chỗ khó hiểu. Vậy mà cũng phải mất một phần ba cuốn mới bắt đầu vỡ vạc và càng ngày càng cảm nhận nhiều cái hay trong tác phẩm. Cầm quyển sách trên tay, đọc những trang đầu tiên, tôi đã biết đây là quyển sách dành cho mình. Giọng văn êm ả dịu dàng, vừa triết lý lại vừa nên thơ. Một nhà văn yêu nghiệp viết của mình và yêu nghề chính (phi công), tôi nghĩ mình cũng chỉ mong có thế. Sách là những câu chuyện của tác giả trong hành trình lái máy bay chở thư băng qua đại dương và sa mạc, những suy nghĩ về nghề bay, về những người bạn đồng nghiệp mà tác giả yêu quý, con người, về sự sống, về ngôi nhà lớn của chúng tay: Trái Đất. Cầm quyển sách trên tay, đọc những trang đầu tiên, tôi đã biết đây là quyển sách dành cho mình. Giọng văn êm ả dịu dàng, vừa triết lý lại vừa nên thơ. Một nhà văn yêu nghiệp viết của mình và yêu nghề chính (phi công), tôi nghĩ mình cũng chỉ mong có thế. Sách là những câu chuyện của tác giả trong hành trình lái máy bay chở thư băng qua đại dương và sa mạc, những suy nghĩ về nghề bay, về những người bạn đồng nghiệp mà tác giả yêu quý, con người, về sự sống, về ngôi nhà lớn của chúng tay: Trái Đất. Và dần dần, thế giới trong cái nhìn của người đã từng làm hàng triệu độc giả trên thế giới say mê với Hoàng Tử Bé hiện lên. Trong đó, hành tinh Trái Đất đẹp kỳ vĩ và lạ lùng, trong đó, con người ta giống nhau nhiều hơn là khác, và ở đó, cái chết cũng có thể dem lại những niềm yên tĩnh lớn lao. Tim tôi đã thắt lại khi đọc đoạn giới thiệu ở bìa gấp rằng Saint - Exupery hy sinh vì mất tích trong một chuyến bay qua Địa Trung Hải. Nhưng sau khi đọc xong quyển sách, tôi nghĩ rằng ông đã có một cái chết êm đềm và đẹp đẽ. "... and suddenly I had a vision of the face of destiny. Old bereaucrat, my comrade, it is not you who are to blame. No one ever helped you to escape. You, like a termite, built your peace by blocking up with cement every chink and cranny through which the light might pierce. You rolled yourself up into a ball in your genteel security, in routine, in the stifling conventions of provincial life, raising a modest rampart against the winds and the tides and the stars. You have chosen not to be pert "... and suddenly I had a vision of the face of destiny. Old bereaucrat, my comrade, it is not you who are to blame. No one ever helped you to escape. You, like a termite, built your peace by blocking up with cement every chink and cranny through which the light might pierce. You rolled yourself up into a ball in your genteel security, in routine, in the stifling conventions of provincial life, raising a modest rampart against the winds and the tides and the stars. You have chosen not to be perturbed by great problems, having trouble enough to forget your own fate as man. You are not the dweller upon an errant planet and do not ask yourself questions to which there are no answers. Nobody grasped you by the shoulder while there was still time. Now the clay of which you were shaped has dried and hardened, and naught in you will ever awaken the sleeping musician, the poet, the astronomer that possibly inhabited you in the beginning." “Nothing, in truth, can ever replace a lost companion. Old comrades cannot be manufactured. There is nothing that can equal the treasure of so many shared memories, so many bad times endured together, so many quarrels, reconciliations, heartfelt impulses. Friendships like that cannot be reconstructed. If you plant an oak, you will hope in vain to sit soon under its shade. For such is life. We grow rich as we plant through the early years, but then come the years when time undoes our work and cuts down our trees. One by one our comrades deprive us of their shade, and within our mourning we always feel now the secret grief of growing old.